Tarantulas are really easy to maintain in captivity, requiring exceptionally low maintenance, making them a truly undemanding pet arachnid. Below we will go over the few key components of their care, in simple terms with descriptive explanations. We will explore housing, substrates, watering, temperature, humidity, and food. 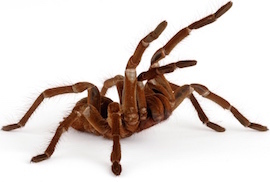 Once you finish reading our simple tarantula guide, you’ll be fully prepared and ready to go! Pet tarantulas don’t require much space, so please don’t make the mistake of providing a large enclosure. Their cage should be approximately 3-4 times their legspan, so if you have a 3-inch tarantula, something in the 9-12 inch range is completely adequate. Most tarantulas are terrestrial, meaning they are ground-dwellers. One thing to keep in mind is that it’s really dangerous for tarantulas to fall to the ground—a 2-3 foot freefall can actually result in their demise due to their thin exoskeleton walls. Make absolutely sure the cage is secure. A lid that simply lays on top of the cage is not good enough. I’ve had tarantulas squeeze through holes 1/4” in diameter. We recommend Exo Terra Faunariums, as the lids snap on, and they have easy access ports for feeding and watering. Small custom enclosures can work well too. Feel free to add decorations, although they aren’t necessary. Tarantulas generally don’t climb much, but one thing you should include is a hide spot. There are many varieties available, ranging from custom caves to flower pots turned upside down with a hole cut into the side. Some tarantulas prefer to dig burrows, which is fine, but it’s still a good idea to offer a hide spot. Make absolutely sure you only keep one tarantula per enclosure. Even if well fed, and with separate hides, they will usually fight, and one may be killed and eaten as a result. Not pretty. Breeding them is another discussion entirely. No lighting is necessary as tarantulas are nocturnal by nature. Does it get any easier than this? Tarantulas greatly appreciate a substrate that is all natural and burrow-ready. Two of my favorite substrates are Eco-earth (ground coconut fiber), and peat moss (readily available at Home Depot, Lowe’s etc), based upon extensive experimentation. The substrate should be slightly damp, but never wet or dry. Remember that whatever you use should be 2-4 inches deep, because as mentioned previously, some tarantulas prefer to dig burrows. You’ll want to make sure that the substrate contains no pesticides or fertilizers—it should be all natural. Pebbles, sand, and aspen bedding are not suitable substrates for your pet tarantula and should not be used. 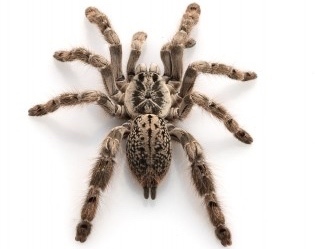 If your pet tarantula spends time attempting to climb the walls, it likely does not like the substrate—it may be too dry, too wet, or contain pesticides, fertilizers, or mold. Some tarantulas will remain on the lid of the enclosure if they are unhappy with the substrate (usually if it’s too wet). Some people like vermiculite, but it contains asbestos, so we avoid it. Sphagnum moss is a decent alternative, as it contains anti-bacterial properties that held ward off mold, etc. Avoid gravel, perlite, sand, and anything pine or cedar based (pine and cedar shavings produce toxic fumes). Providing a water dish isn’t necessary, but it is advisable. Most tarantulas get their water needs from the insects they consume, and you’ll probably never actually witness your pet tarantula drinking, but offering an alternative source of water is always a good idea. Water dishes also help increase the humidity a bit, which is usually a positive. Replace the water when it becomes soiled by dirt or prey items, usually every 2-3 days. Avoid any wet sponges, cubes, or cotton balls as they tend to harbor bacteria and get dirty quickly. Do you know one of the beautiful things about tarantulas? They do best at room temperature! This means no need for supplemental heating, so long as you can keep temperatures in the 70F to 80F range. 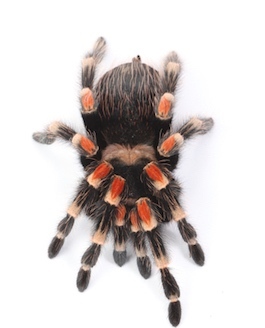 Most tarantulas require some humidity, or they will desiccate (dry out). 50% to 75% humidity is ideal, and this can easily be achieved by keeping the substrate slightly damp (again, never wet or muddy), and by using a water dish. The more “sealed” an enclosure is, the more humidity will be trapped (the less screen the better). Never let it get so humid that droplets appear on the sides of the enclosure. Spiderlings (baby tarantulas, around 1/4” to 1” in legspan) tend to require humidity on the higher end of the spectrum since their exoskeletons aren’t as hard and thus don’t prevent loss of moisture as well. Tarantulas are entirely carnivorous, which means they only consume animal material (primarily insects), and do not ingest vegetation of any kind. I feed my tarantulas crickets, waxworms, mealworms, superworms, and sometimes roaches—although roaches have a slightly tougher chitin (exoskeleton) to pierce. The biggest tarantulas can even be fed baby mice (pinkies), and even sub-adult mice. Variety is the spice of life, and various insects have different vitamin and mineral compositions, so mixing up the feeder items is always appreciated by your pet tarantula. Tarantulas generally prefer live food, being ambush predators (sitting and waiting for prey to walk by) but will also usually accept freshly pre-killed food as well (freshly dispatched crickets, etc). If you have a small tarantula and large feeder insects, just pre-kill the feeder insect and the tarantula will often feed on it. 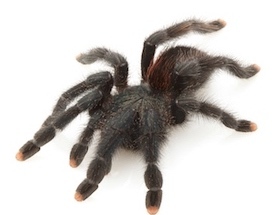 The general rule is not to offer a food item longer than your tarantula’s abdomen. They can take down larger animals like mice, which are of course longer than their abdomen, but this would only apply to large tarantulas such as the Goliath Bird-eaters. Tarantulas only need to be fed once or twice per week—you definitely don’t want to feed every day. In fact, some tarantulas can go for several weeks or even months without food! Yet another reason these fascinating animals are so easy to maintain. That’s it! Go forth and enjoy your pet tarantula! We hope our tarantula care sheet has helped prepare you for the exciting journey you’re about to begin. You can visit the Wikipedia page on tarantulas for more general information.